Hello Friends. Today i want share with you Miracle all in one crack utility without Hardware ID without Password i hope you like this post. China smartphone All Spd Supported & Much more.New & Old Android smartphone Official Bin firmware Read & Write Supoort.Format Always safe No Dead & any risk Just Select Advanced Mode.Clear Code Support Aread Added.Spreadtrum Spd New & Upcoming All smatrphone Suppoted. China FeaturePhone ( Button) Mobile All Supported.Mtk china Official Bin file read,write,File Unlock,Password Unlock,Password Remove,Imei Repair,Format,file write.Spd flash file read Bin,write Bin & Pac file,flash Suport,Unlock support,Password Remove Support.Any Feature Mobile Phone Deadboard Repair Done by Chinese Supported Miracle Box. Nokia All Feature Phone flash,Unlock Supported.flash file Read,Write,Format,Clear Code,Remove Security Code & Much More,Nokia 220.220.108.225.230 & Any Mediatek Chipset Nokia Mobile Flash file Read,write,Format Supported. Samsung Galaxy Manu smartphone firmware Write,OPattern Lock Remove,Frp Lock Remove,Restart Problem Solved.Samsung Scloud Lock Supported.Google account Lock Remove.Smasung Many smartpone Country Lock Done.smartphone Samsung Android Jingerbread,Ice cream sandwich,Jellibean,Kitkat,Lollipop,Marsmallo Mobile Phone Suppored Area only Way Solution Miracle Box & key. Huwei Many Smartphone Counyrt Lock Supported & Much More. How To Setup & work Miracle Box? 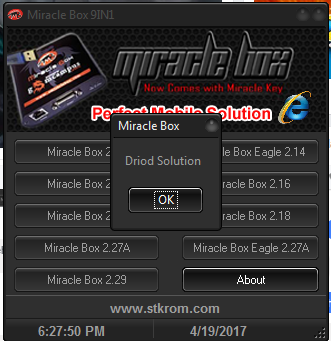 Miracle Box Latest Update Setup File Download.Find Download Option On Your computer & Unzip Downloaded miracle setup file.Double Click This file & Click Nexe,next & Setup Done. 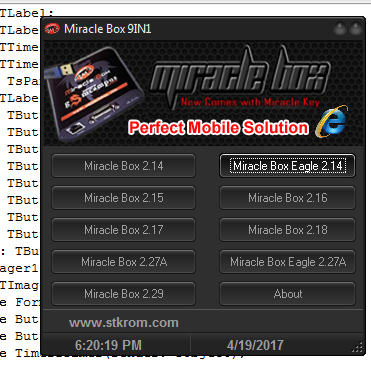 Insert Miracle Box & Key on your computer or Desktop.Setup Miracle Box China Driver.Open Miracel Box Tools & Work Enjoy Miracle Box. Something Support smartphone Company Names: Samsung, Nokia, ,Huawei, Lenovo, Zopo, Xioami, Amoi, Ule phone ,Oppo, Micromax ,Maximus, Walton, Symphony ,Gionee, Acer ,Karbon ,Qmobile, Xolo, Lava, Xtouch, Intex, Winstar, Winmax, 5,Star,Blue, Gfive, Oukitel, Hisense, Iball, Itel, Intex, Lemon, Okapia, Maxx, Celkon,Colors, AAmra, Alcatel, Asus, GDL, Forme, Gplus, Nokia Clone,Iphone Clone,Samsung Clone, Mycell, Obi, Opal, Opsson, Peach,P hilips, Strawberry, Telego, Sunup,Yxtel, Zears, Coolpad & Much More.